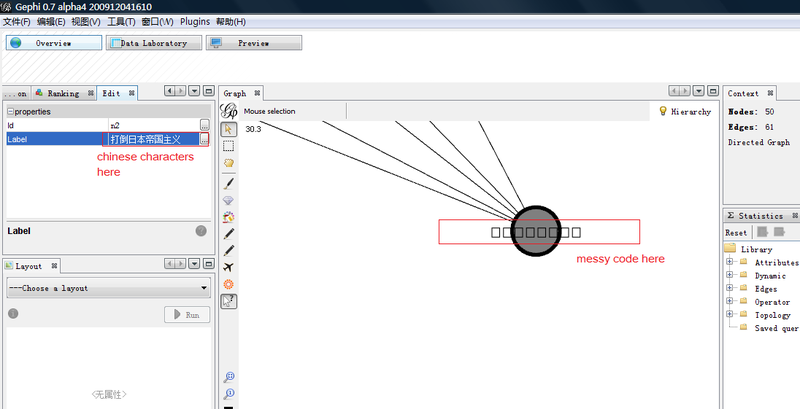 I am doing my email import module and I found a problem while displaying chinese characters. For example, I generate a random graph, and the label of nodes is "null" while displaying. After I edit the label attribute, and change "null" to a certain chinese character. messy codes appear on the display view. I noticed that it works if you select another font. Apparently the default Arial Font is not unicode. After reading the Java FAQ (http://java.sun.com/javase/technologies/core/basic/intl/faq.jsp#font-selection) we may select Dialog for instance as a default Font.